Maybe it’s the perennial summer we have here in Malaysia or the anticipation of holiday eating, but more and more everyday I find myself wanting lighter and healthier meals. For many though, ‘lighter and healthier’ is synonymous for ‘bland and a buzzkill to eat’. This dish is fast becoming one of my favorite recipes to make for lunch and dinner. Lentil cakes that are crispy on the outside, soft and savoury on the inside and are delicious wrapped up in a tortilla or fluffy naan bread. Paired them with fresh cucumber and tomato, a drizzle of lemon and garlic yogurt sauce and a dab of chili and you have yourself one tasty little wrap. If that is still not your thing, you can always serve it up as a side dish paired with a nice roast chicken or a bit of lamb. It might make you reconsider the previously neglected ‘light and healthy’. Saute diced onion and minced garlic in 1-2 tbsp of olive oil over medium heat until transparent. Drain and wash the canned lentils. Add them to saute pan with onions and garlic and cook for 3-5 minutes just until the lentils have picked up some of the flavor of the onions and garlic. Sprinkle with cumin and paprika and stir. Continue cooking for 2-3 minutes. Season with salt and pepper. Remove from heat and puree mixture in a food processor with fresh cilantro. Puree until smooth. Transfer mixture to a bowl, add flour and cornstarch and mix until thoroughly combined. Fry in 1-2 tbsp of olive oil on medium heat until golden brown of each side. Remove from heat and drain excess grease on paper towels. Makes 8-14 patties (depending on size). Combine lemon juice, yogurt and minced garlic together. Season with salt and pepper to taste and let rest for 10-15 minutes before eating. Wash and dry cucumber and tomatoes. Cut off stems and discard. 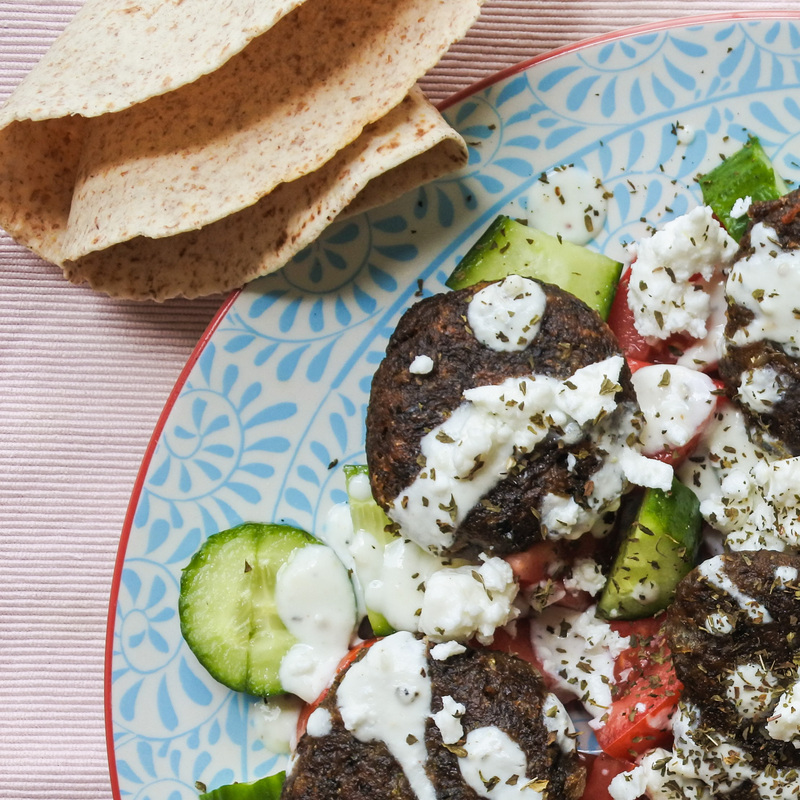 Place lentil patties atop salad and drizzle with yogurt sauce. Sprinkle with crumbled feta cheese, serve and enjoy. Drain and wash canned lentils. Wash and dry cucumbers tomatoes. Cut off stems and discard. Dice cucumber and tomatoes in bite sized chunks (no bigger than 1 in / 2cm) Lightly drizzle with olive oil and sprinkle with salt and pepper.